PRODUCTION EXPO 2013: It's quite possible that Butch Vig is tired of hearing his name mentioned in the same sentence as Nirvana's Nevermind, but in this case we think it's justified. The rousing thunder of Dave Grohl's opening drum line in the still-electrifying Smells Like Teen Spirit still stands as the most iconic drum sound since the days of Bonham and Moon. 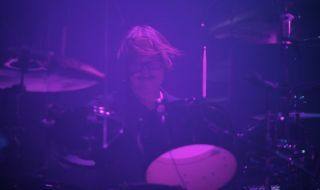 The Garbage drummer's production credentials don't end there, of course: Smashing Pumpkins, Sonic Youth, Green Day, Foo Fighters and Muse have all called on the services of Vig in their pursuit of a mountain-moving rock sound. Do you see yourself predominantly as a drummer or producer? "I probably look at myself as a producer first and foremost. I really love the studio. As I've found out, my live chops need a lot of work. It's one thing recording a song and doing two or three takes but now we're rehearsing six hours in a row to get things tight for live. It's a long uphill battle to get back into fighting shape, but I'm slowly getting there. When I'm in the studio I don't really practice. There was a long chunk of time I didn't even sit behind a drum kit when I was working with Green Day or the Foo Fighters." Do you have a go-to drum sound you like to get when you're recording? "It's really project by project. I try to follow during pre-production what everyone is playing, particularly the rhythm section. For instance, with the Foos I'll notice what Taylor defaults to, how he likes his tuning. But I'll be listening in the track too to see what the song calls for in terms of playing and sonically. "I like drums to be tuned more mid or low, I like mid or lower snares, I don't like super high tuned snares. Luckily, someone like Taylor is pretty easy going. I might suggest a snare to use on a track, we'll put it up and if it sounds right on the track he's not too picky. Neither was Dave. Dave would listen to the drums and say, 'They sound great, man'. He'd leave it up to me to make sure the drums sound good in the context of drums and bass." Are you hands on with drum sounds and parts when producing? "I get pretty hands on. I think part of it is that I'm a drummer and I'm always aware of what the groove sounds like, what the drums sound like and what particular fills are. I think that's been one of my strengths. I've always got in the back of my head that it needs to work for the song. That's not to say you can't have moments the drums jump out and get to shine on their own. "I mean like 'Rope', who does a drum solo in the middle of a bridge these days?! Not too many people! That was a really fun moment. To me that song was totally cool and allowed to have those drum fills. That song with the feel and stop and go rhythm guitar pattern had a prog feel and with the Foos they have that kind of thing every now and then so it made perfect sense that we could do that kind of arrangement." You helped influence a lot of drummers with the Nevermind drum sound. How do you think it stands up 20-odd years on? "I think that record sounds great and the drumming and drum sounds are great. Part of that is that it's pretty simple and not gimmicky. Drum sounds can be defined by a certain era and then frequently they sound dated when a style or fad moves into fashion. Just the way I recorded those drums was pretty standard. Miking kick and snare, overheads, toms and some room mics. Having said that the room we recorded that in at Sound City was amazing and part of it was that Dave Grohl is an incredible drummer. I think that helps it all sound fresh. I think it's a great sounding rock record and his drumming is incredible." Have your methods for getting drum sounds changed much since Nevermind? "I don't get uptight about how I record drums any more. There was a period post-Siamese Dream where I started getting more and more detailed - using more microphones, more pre-amps, spending more time getting sounds. It was around the time of the first Garbage record where I threw all of that out the window. "If there's only two mics, lets do kick and snare and record it in mono. I guess for me what's exciting is that I don't think there are any rules. If you've got a track that calls for really precise drums, a Neil Peart drum part or something, you'll spend a lot of time getting things balanced and use a lot of different mics and different drums to get this incredibly transparent, clear sound. But that's not to say if you just want a trashy room sound you cant just put one mic in a corner if you get the right balance. "It depends on the kind of vibe you're going for. Drums really give the listener a sense of where a song has been recorded and where it's taking place. If you have guitars, bass and drums and put on a huge room-y drum sound with lots of reverb it's going to sound like it was recorded in an arena. If you mute those and just put in a tiny kick and snare that's very dry with no reverb it's going to sound like it was recorded in your bedroom. "The decision making process of how you record the drums and how much equalisation and ambience and compression and whatever you put on them defines the space of where the listener perceives the song is. It's powerful when you realise you can radically change how a listener is going to perceive a song." Do you have a preferred mic set-up when tracking drums? "It's different from band to band. I usually like a dynamic mic on a kick for a close mic but I like the fat 7s for the thumpier, woollier sound. Sometimes I'll use a 57 on a snare, sometimes I'll use a condenser, an AKG41, I might use a ribbon mic on a snare especially if there's a lot of hi hat bleed. "I have a tendency to like condenser mics on drummers that don't hit the cymbals real loud, and if they do hit them loud I like to use ribbon mics because they're softer in the top end. "Sometimes I'll record with stereo ambient mics, sometimes I'll just put up one and try to compress it out of a preamp really hard or run it through an effects pedal to give it a vibe. I'll run the drums to some sort of stereo compression and then really hammer it. "So any time you feel it's not very exciting, you bring those up and the drums go crazy with compression. A lot of the time we use the Roger Mayer compressor the RM58. It's one of the most extreme, crazy compressors in the world. They're great, there's nothing that sounds like them in the world. It sometimes makes things sound like early Who records." Do you like to pan the kit in the mix? "Usually kick and snare down the middle with the overheads wide left and right. Sometimes I'll position them right over the drummer's head so it's from a drummer's perspective. Sometimes I move the overhead mics directly over the cymbals. "With room mics I'll try to move them around so when you bring them up in the mix you can see the space the drums are in. With toms I usually pan left and right. I don't usually pan them hard left and hard right. I like to get it so it make sense as if you've got a drummer playing ten feet in front of you. "Sometimes if you're using all programmed beats it's good to throw it all out of the window and f*** with your head a little bit, so put the kick down the middle and the snare off to one side with maybe the cymbals to the other side and the toms doing a weird automated pan back and forth or something. It all depends on what the song calls for." When tracking do you prefer the entire band to track live? "With Garbage, every song is different. With a band like the Foos we tracked that live so it's basically them going for rhythm takes between Dave and Taylor making sure we had a core and then we'd overdub Chris, Pat and Nate. With Green Day I would go in and Billie, Mike and Tre would record live together, but I was just going for keeping Tre's drums. Billie would go back in later and overdub his rhythm guitar and Mike would do his bass." What preparation do you put in drum-wise before heading into the studio, whether it be with Smashing Pumpkins, Foo Fighters, Muse or an unknown band? "I don't get too crazy with tuning. I'm pretty good at tuning but I have a drum tech called Mike Fasano. Usually I'll get him in on the first day, whether it be with Garbage or working with someone else, I'll have him come in and tweak the drums. On Day One I like to have the whole day to set everything up, including the amps. "The majority, though, is getting drums set up and EQ-ing, compressing or whatever. When you come in on Day Two you're ready to record. I think you should be able to get a good drum sound in a day. If you can't, maybe you're over thinking it or maybe the drummer isn't very good!" Is there a danger of drummers trying to over perfect their sound? "I think that happens some times. Everybody will perceive how drums should sound in a different way - whether it's the producer, engineer or the drummer. Sometimes you get obsessed with things, like the kick drum isn't punchy enough, or the snare isn't sitting right and sometimes it's the player, sometimes it's the microphone, sometimes it's the wrong snare for the song and you need to fundamentally change it. "You can run into those problems and when you do the first thing you have to do is see if the drummer is causing the problem with the way he's playing or the part and then you start looking more at the technical parts of it. You look at the microphones, the kind of drums and try to figure out why it's not working." Is mixing typically a key point for an album's kit sound? "On some albums it's defined. With the Foos the sound of the garage - it is what it is. You can EQ and compress a little in the mixing, but it wouldn't change the sound profoundly. That was good in a way because from day one we knew the sound of the drums. Sometimes in the process of making a record the quicker you can make decisions and move on and not leave it all to the mix process that's a good thing. If you can define those drums early on that will help later on." This interview in featured in full in Rhythm issue 203. Discover more about the issue here.